Sunday, April 2: I’ve still not adjusted to Japan time, so I am awake a couple of hours in the middle of the night. Because of that, I sleep in till 8:00. It feels so good once I go back to sleep, I don’t want to climb out from under my cozy futon. When I finally get up, I make myself some fried eggs, a bit difficult without a spatula. I use a fork, and it is a mess. I also have a carton of cold milk tea from 7-11 which I heat up, but I resolve not to drink tea again. I’m a coffee person, through and through. I have been undecided about doing a big outing today because the weather forecast is cloudy and cold. We also have off Monday, and the forecast is better for Monday. However, the skies have hints of blue this morning, so I rethink my plans. 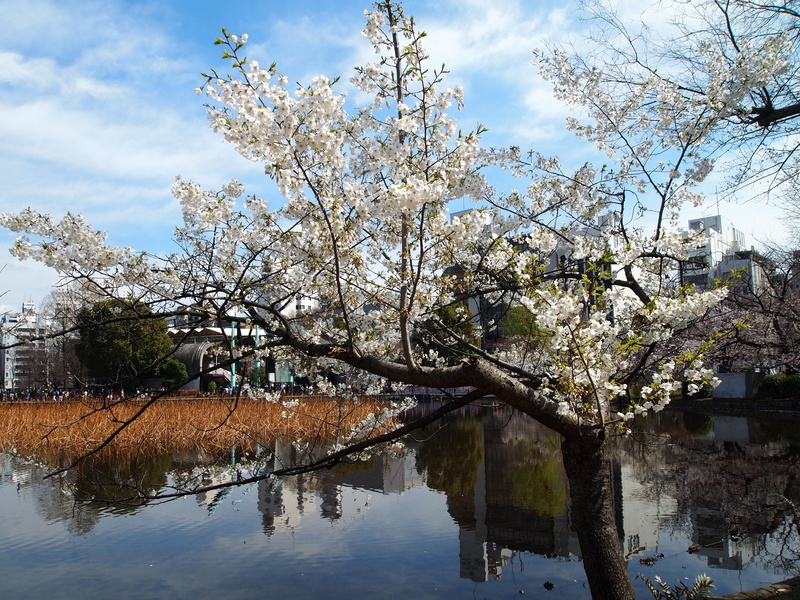 Today is supposed to be the peak of cherry blossoms in Tokyo and I’ve been told THE place to see them is Ueno Park. 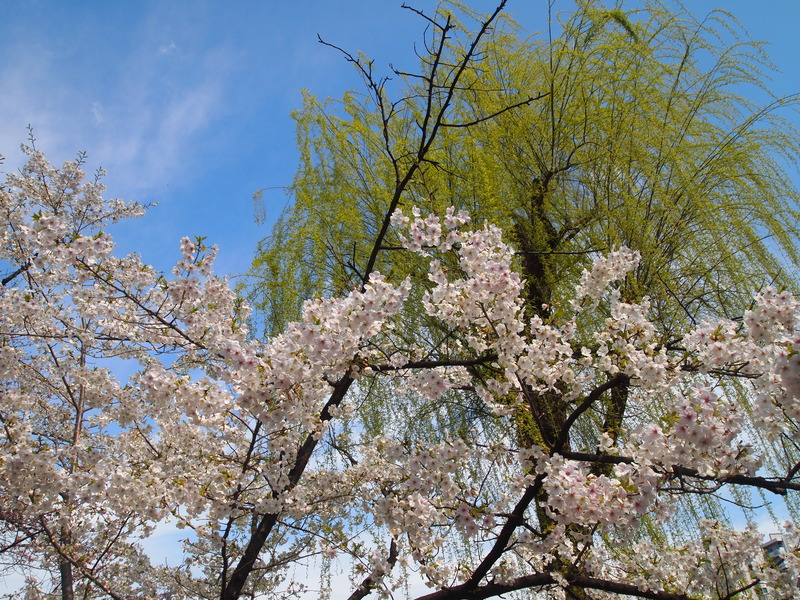 Cherry-blossom viewing is called hanami in Japanese, and as it’s Sunday and peak time, I expect there will be huge crowds. 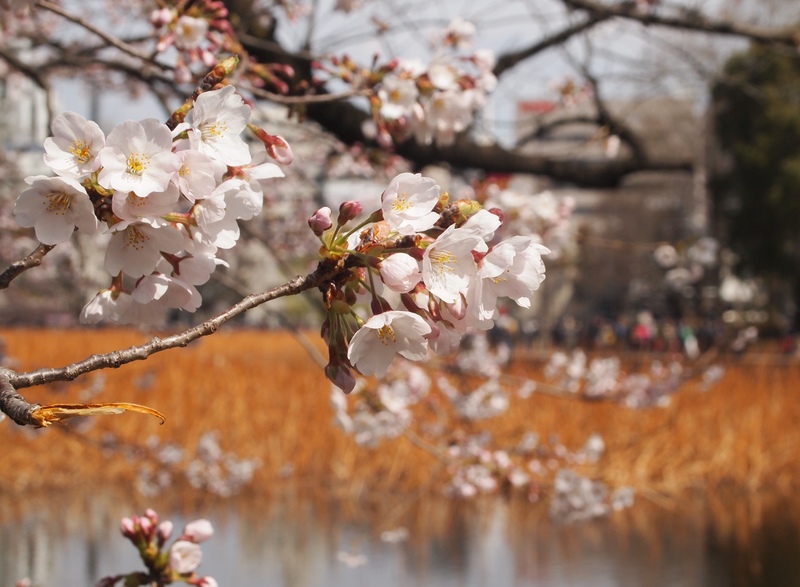 Still, I guess that’s what hanami is all about – the whole festive atmosphere and mingling with millions of Japanese all at once. Walking Tour 9 in my book, Tokyo: 29 Walks in the World’s Most Exciting City, covers Ueno, so I figure I’ll do that. 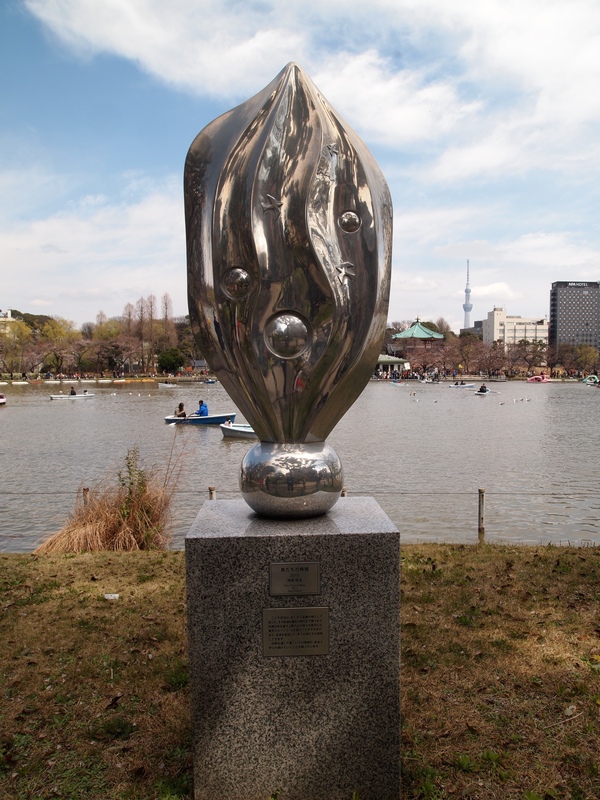 Ueno Park has a bunch of museums within it, and since they all seem to be closed on Mondays, I’ll be limited in my choices if I wait till Monday. Also, for my first solo outing negotiating the Tokyo metro, it won’t be too intimidating as it’s the exact route I took yesterday for our orientation. All this figuring and rethinking leads me to a very late start, which I’ll come to regret later. I debate whether to ride my bicycle to metro (a 20-minute walk) because I hadn’t seen a bicycle parking area. If I rode my bike all the way there and couldn’t find a place to park, I’d have to ride back home and then walk. I ask a couple of Japanese people along the way, including the bicycle shop man and his mother, but no one understands me. Finally, a young Japanese woman points me to the left of the station, a couple of blocks down. I see people disappearing into a garage opening pushing their bikes, so, voila, I follow them. There are steps bordered by ramps leading to a second level and I’ve found the bicycle parking lot. I find a less crowded area toward the back, so I park there, but when I ask a man in business attire if I need to pay, he tells me in his limited English that the back area is for yearly pass holders. He says because it’s Sunday, I don’t have to pay, but I would have to pay Monday-Friday. At first he tells me 1,000 yen, and when I look shocked, he corrects himself and says 100 yen. He motions that I should park near the front of the parking lot. 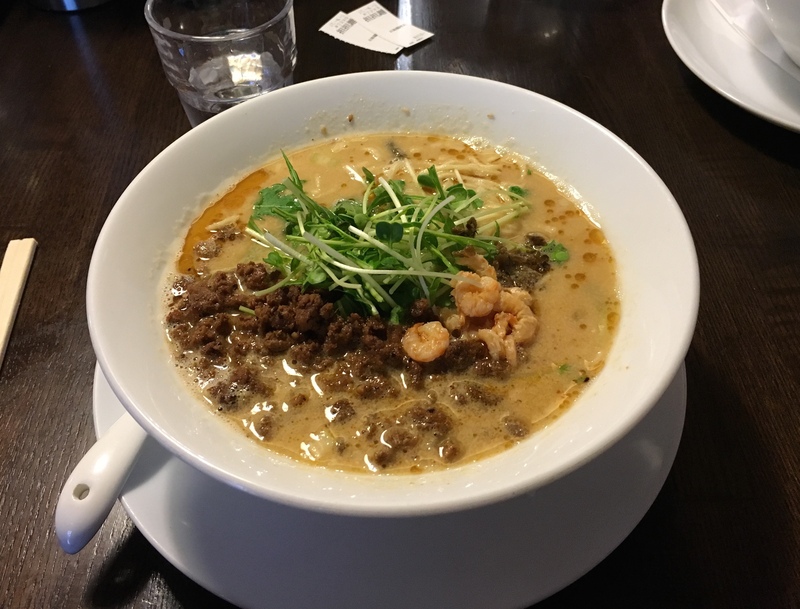 After the long metro ride, which I won’t cover in detail as it’s the same one I took yesterday, I arrive at Yushima Station and walk toward Ueno Park, right past our ramen shop where we had lunch yesterday. A long line of about 10 people stands outside. 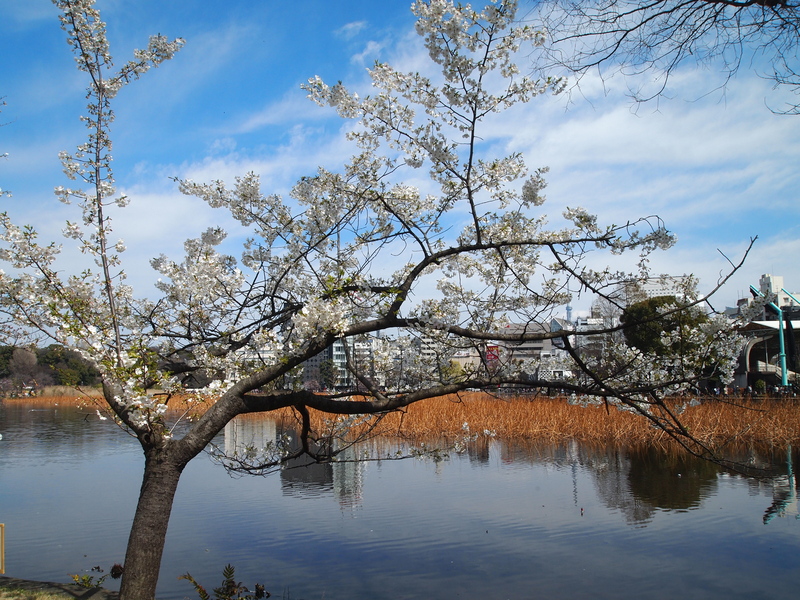 I follow the path to the left of Shinobazu Pond, using my Walk 9 as my guide. 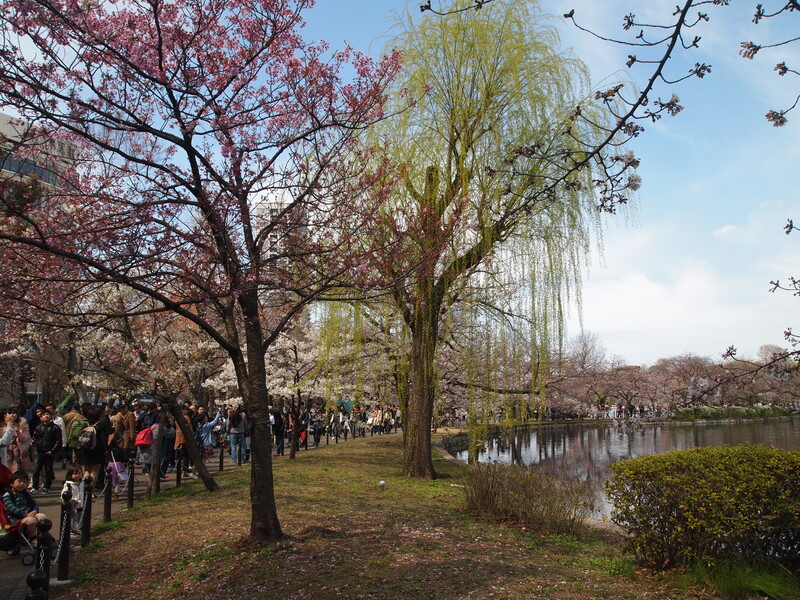 The cherry blossoms seem a little past their prime, but that doesn’t stop the hordes of people who have come for hanami. Every inch of grass is covered by groups of Japanese picnicking and laughing and talking. The path is packed with people as well. 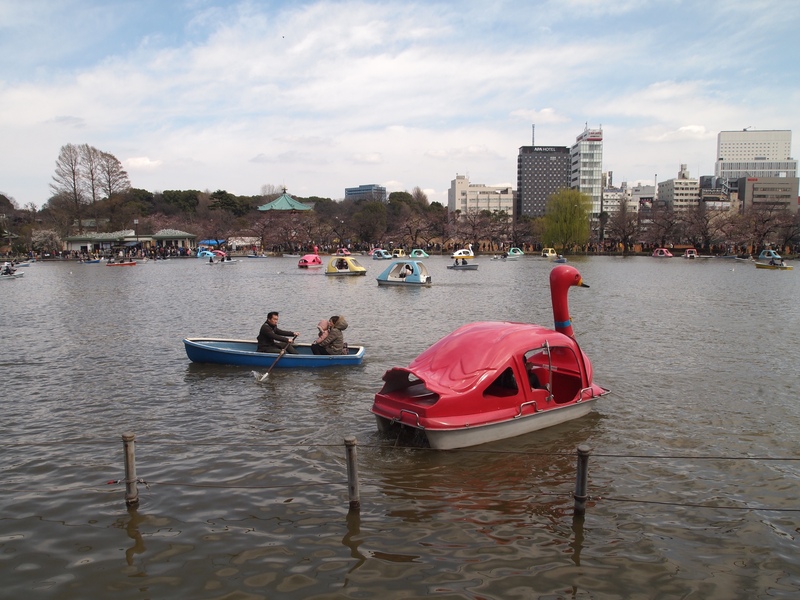 The second portion of the pond is full of people skittering about in swan-shaped pink paddle boats and row boats. At this point, I’m to cross Shinobazu-dori and visit the House of Taikan Yokoyama. 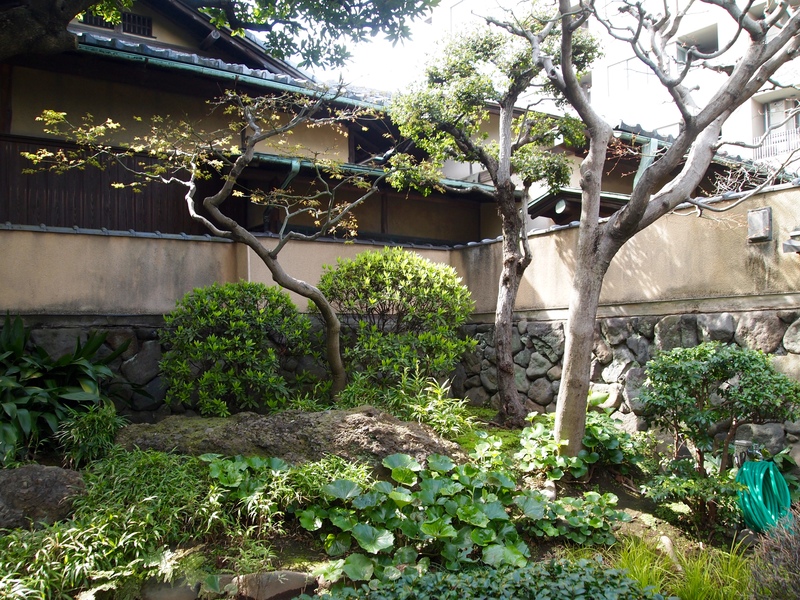 I debate whether to enter the House of Taikan Yokoyama as no photos are allowed inside and it cost 800 yen. After walking away once, I decide to go in anyway, and I’m glad I do. 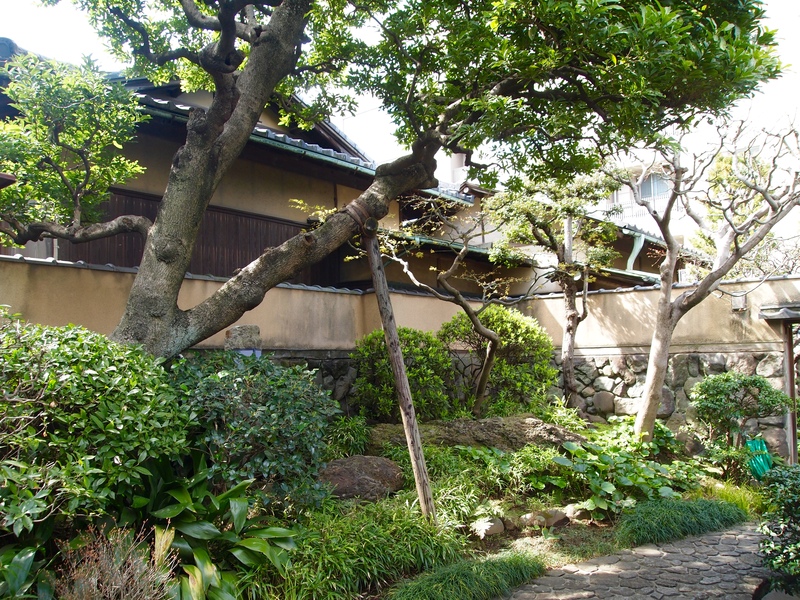 The artist’s traditional wooden house is in the sukiya style found often in Kyoto. I’m allowed to take pictures in the entry area, shown below. 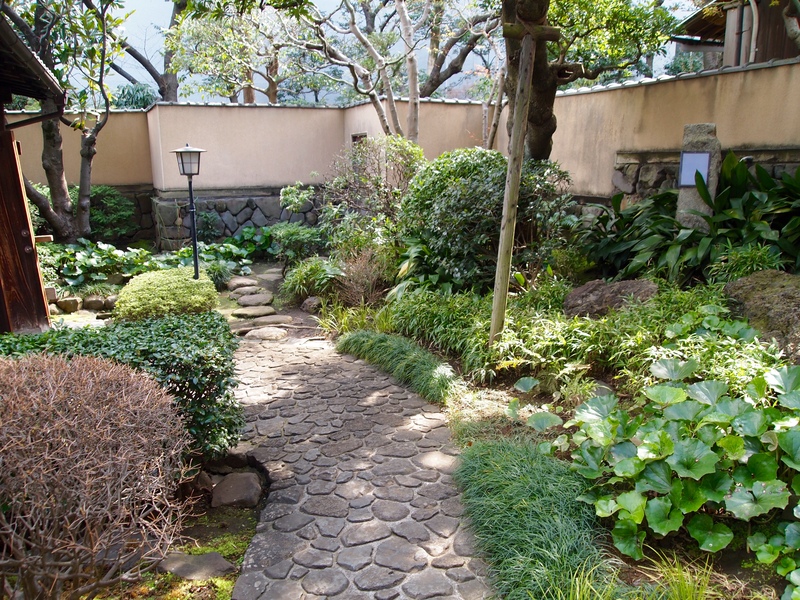 After removing my shoes, I go inside the house to see the tea room, with 15 windows looking out upon the artist’s garden, and a brazier in the middle of the floor with a teapot hanging over it. The adjacent studio workroom contains the artist’s working tools. I go into the upstairs bedroom, which also has a view of the garden. 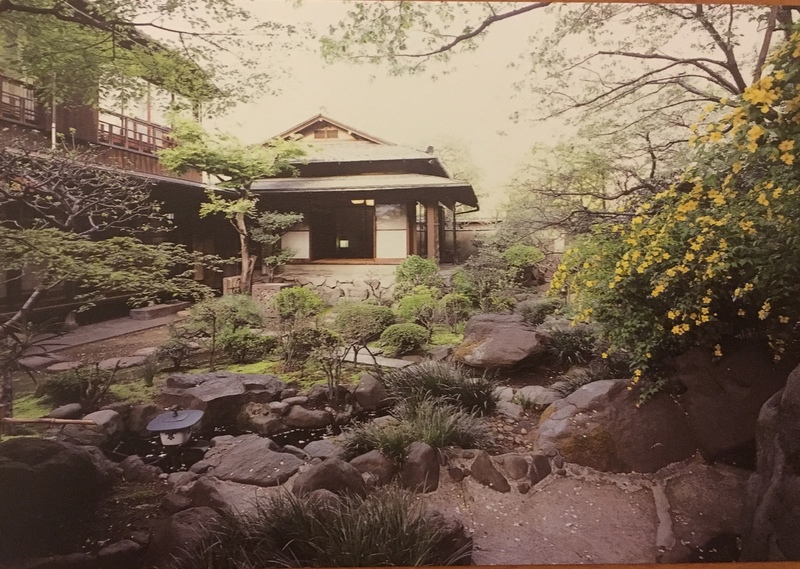 Since I can’t take pictures of the house, I buy a postcard showing a view of the house from the back of the garden, shown below. 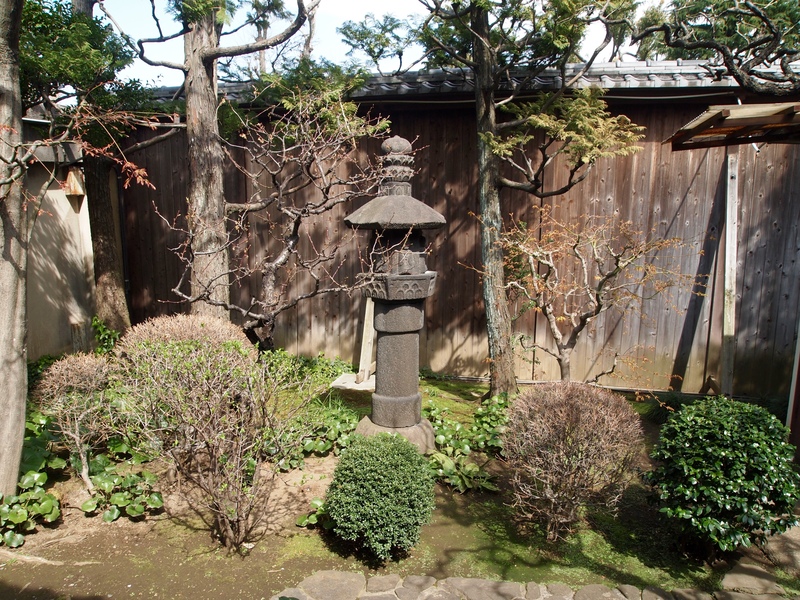 The garden is lovely, with its little stream, rocks, carp in the pond, and stone lanterns. 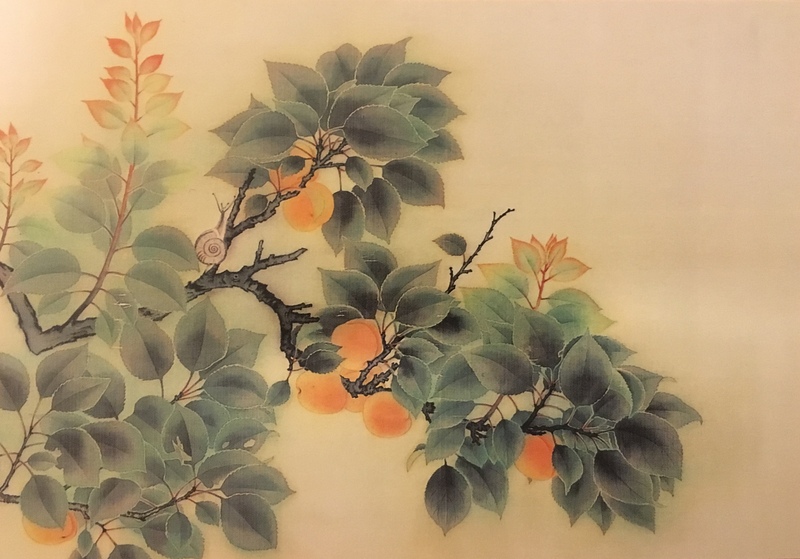 Taikan Yokoyama (1868-1958) spent much of his life in this house, painting in the traditional Japanese Nihonga style, but adding Western approaches to painting later. I also buy some postcards of the artist’s work. I pick out three, plus the one above picturing the house, and the clerk holds up five fingers, but I’m not sure what she means. Finally, she gets her co-worker to explain to me in English that I should buy 5 for 500 yen. Once the woman finds out I am a teacher in a university, she loads me up with 4 booklets about the museum to hand out to fellow teachers, which I now have to carry around the rest of the day! Below are more postcards of Taikan Yokoyama’s art. Click on any of the photos for a full-sized slide show. 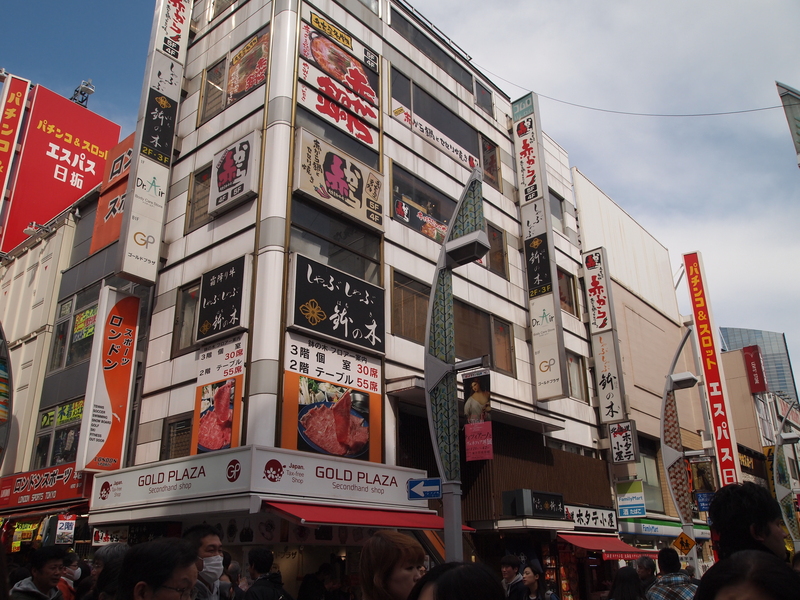 I follow the walk back down Shinobazu-dori to the metro stop where I started, and take a left at Kasuga-dori, and go down a ways until I make another left onto Ameyoko Shopping Street. 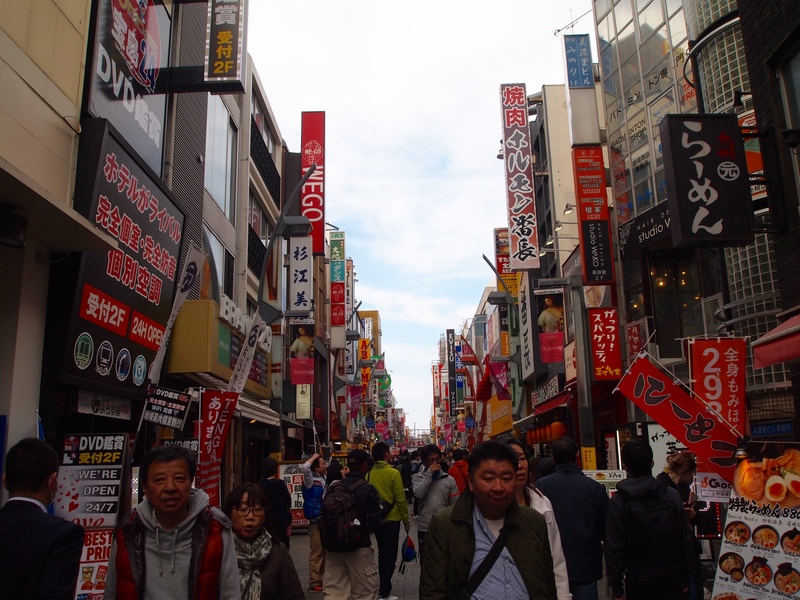 More than 500 shops crowd this quarter-mile bazaar under the elevated rail line for the Ueno rail station. 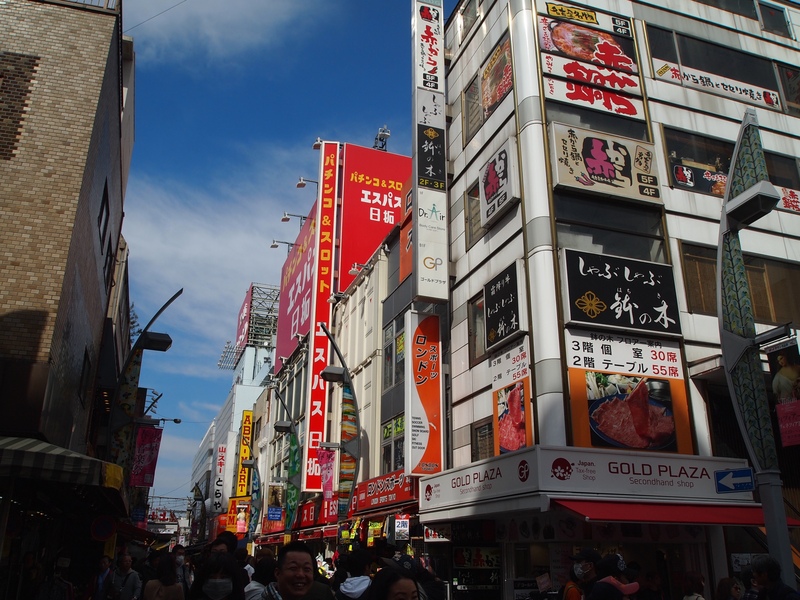 The name Ameyoko combines two words, Ameya Yokocho, or “Confectioner’s Alley.” After the Korean War, a pun evolved from the contraction of American Market, since the area sold black market goods from American military Post Exchanges during those years. The small shops here now continue the tradition of the Shitamachi, in which small-scale vendors have always operated, selling a wide variety of goods. 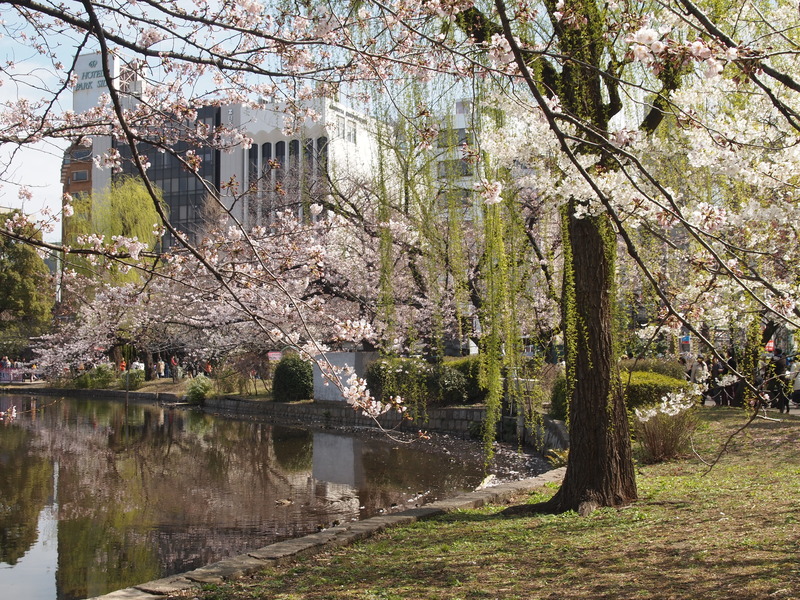 After this, I continue back into the main part of Ueno Park, where the real fun begins! Friday, March 31: We have a full day orientation in Tokyo today, so two of my colleagues and I leave our apartment building at 6 a.m. to negotiate the Yokohama and Tokyo metro system. We walk 20 minutes to Fuchinobe, where we take the JR Yokohama line (local) and get off at Nagatsuta. We then switch to the Tokyo Denentoshi Line (Semi-Express) for Minami Kurihashi, getting off at Shibuya, Tokyo’s busiest station. However, we don’t leave the station, as we switch to the Tokyo Metro Hanzoumon (Express) line, getting off finally at Kudanshita. All of this takes 2 hours, door-to-door. Much of the time, the trains are packed, with standing room only. We figured this would be the case on a Friday morning, and we were right. 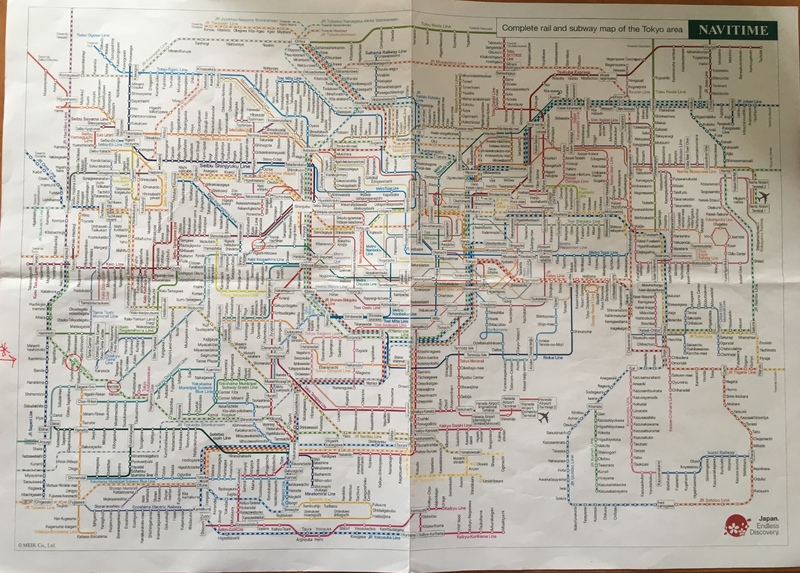 The Tokyo metro is like nothing I’ve ever seen. Below is a photo of the map. We are on the outskirts, indicated by the circle around Fuchinobe on the lower left quadrant of the map. Yokohama is further south and to the right on the lower left quadrant. One thing I love so far about the Tokyo metro is that every station has a restroom! I wish the Washington, D.C. metro had the same. It is so civilized! It’s always a relief to know I can stop if I need to. We don’t see this on the Yokohama line, but on the Tokyo line, white-gloved uniformed conductors with hats stand evenly spaced on the platform edge; they whistle and wave yellow cloths or red plastic batons to signal the platform is clear and the doors can be closed. It’s a delight to watch. At Kudanshita’s Exit 5, we’re to turn left at the Starbucks on the left and go straight to Bellesalle Kudan, a large building, possibly a conference center. Since we’re an hour early for orientation, which begins at 9:00, we get coffee at a McDonald’s near the metro instead. The morning session is for new teachers to Westgate. In the afternoon, the returning teachers join us. All of us are teaching in the accredited program. Westgate’s other university program is called the extra-curricular program. I believe that starts later in the month. There are nine teachers at our university in Westgate’s accredited program. At lunchtime, I go with two of my colleagues to an Indian restaurant and have an impressive airplane-shaped naan, dal curry and a mango lassi. Some of us wish it wasn’t lunchtime so we could enjoy a beer. After orientation ends at 5:00, and we are back on metro, we’re on the lookout for the Nagatsuta stop. We think we are going in the right direction but we’re not certain. A tall thin Japanese man with gleaming brown Oxfords, longish straight black hair and glasses which give him a nerdy-smart look, overhears us discussing this conundrum. I notice him inclining his ear toward us and then checking the metro map and counting stops on his fingers. I say to my colleagues “He’s helping us,” and he turns to us and tells us we have four more stops, saying Nagatsuta and putting up 4 fingers. When we get to the station, he says, “Here.” He is so kind to help us out without speaking any English and without us asking. I say “arigato” and bow to him. It is rainy and cold as we leave the station and the guys are walking so fast I am practically running to keep up with them. Tobias doesn’t have an umbrella and wonders whether he should go out of his way to the big pink superstore to buy one. He decides against it, and on one long stretch on the way home, a man suddenly appears and offers a bright green umbrella to him. Two kindnesses in one day. I say, “All we need is a little kindness in the world.” I feel especially happy for these gifts, and relieved to be far away from the U.S.A., where kindness is becoming increasingly difficult to find. Joe and I go to the 7-11 for a few things. Suddenly, Tobias, who had gone straight back to his apartment, comes to the 7-11 to warn us that the guy selling television subscriptions is hanging around the apartment building. I don’t want to pay for using the television in my apartment as I never watch it. Everything on it is in Japanese, except maybe a couple of stations, and I watch everything I need on my computer. We have been advised not to answer the door to this guy. Later, he returns, close to 8:30 p.m., knocking and ringing the doorbell, but I pretend I’m not home and don’t answer the door. I was happy to get home to my warm apartment (well, it took a while to warm it up after such a cold and rainy day), especially after the long walk in the rain in my flimsy clothes. I enjoyed a prepared dinner from 7-11 of tiny mussels with veggies on rice, spicy cucumbers, and an Asahi beer. 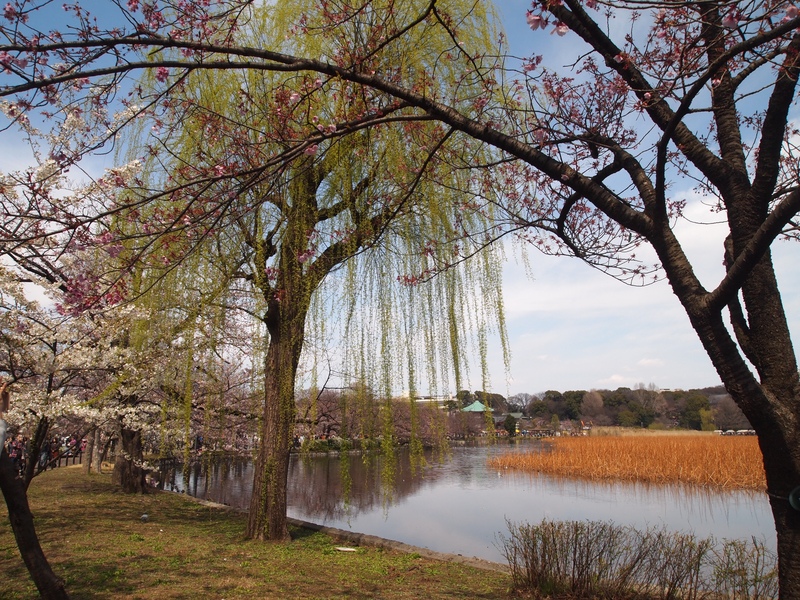 Saturday, April 1: Luckily we don’t have to go into Tokyo for our campus-specific orientation until 10:00, so I have a bit of a leisurely morning. I prepare my first breakfast in my tiny frying pan: scrambled eggs with grape tomatoes – except without a spatula. Another thing to add to my list. Now that I’ve bought a few things and my suitcases have been unpacked, my apartment is starting to look a little cozier. I meet my colleagues by the vending machine at 10:00 a.m. and we’re on our way to a different location in Tokyo, the Westgate Corporation office. This time we walk 20 minutes, take the Yokohama Line to Machida (7 min), then get on the Odakyu Line Rapid Express for Shinjuku (26 min), which is standing room only. At Yoyogi-Uehara we transfer to the Tokyo-Metro Chiyoda Line (23 minutes). We get off this line at Yushima. All told it’s about an hour and 20 minutes. 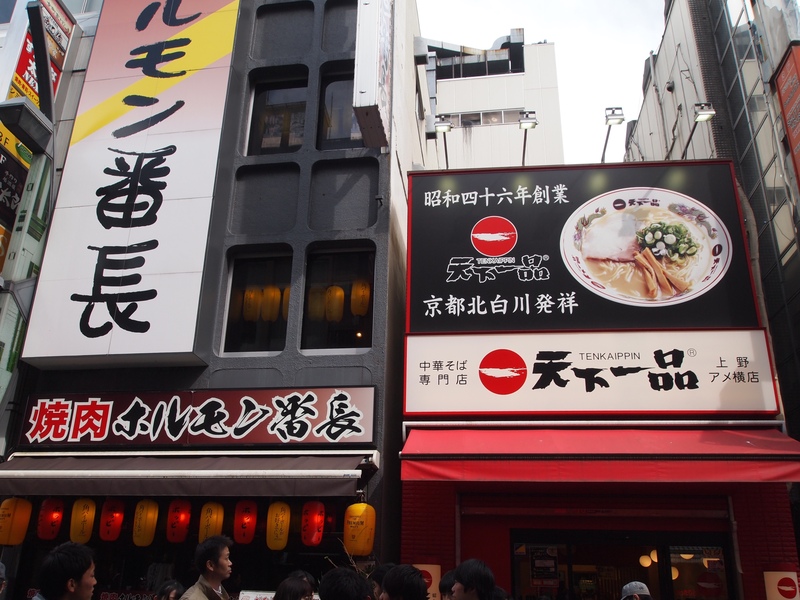 As soon as we exit the Yushima Station, we go in search of a ramen restaurant. One of my colleagues has lived off and on in Japan for eight years, so he knows exactly what to look for. We find a cozy little spot where we order from a machine covered in pictures. I have no idea what I am going to get, but the picture looks enticing and a young man informs me that it has baby shrimp in it (always a selling point! ), as well as some minced pork. We sit at the bar and soon the waitress brings three steaming bowls. I have ordered #2 spicy (out of 5), and it is perfect. I could have eaten a bottomless bowl of this soup. 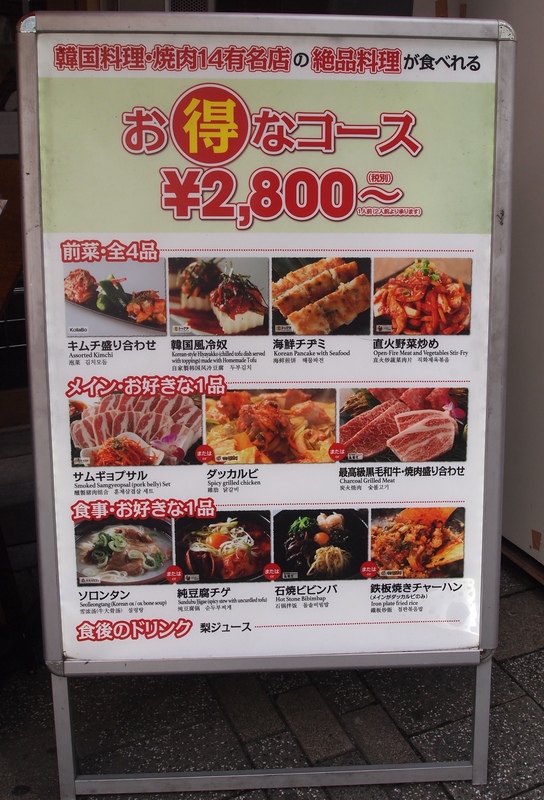 This is the best meal I’ve eaten in Japan so far. I guess since most of my meals have come from 7-11, that’s not surprising! During lunch, I talk with a young Japanese man who works in quality control at a machine parts factory. He is heading to work after lunch. He’s very friendly and I really appreciate him for making an effort to speak English with us despite it being a struggle for him. It turns out the Westgate office looks somewhat like an apartment made into office space. It’s a warm and inviting place for a small group meeting. Reiko, CDT (Curriculum Development and Training), is very organized and has a laid-back demeanor. We get our schedule and it looks like I’ll be teaching three classes a day on M, Th, and F, 90 minutes each, around 20 students in each class. Each of the three classes will be the same lesson, much like what I had in China, except I had four of the same class in China. That means one prepared lesson plan per day. On Tuesday and Wednesday, I’ll also be teaching the three classes, but spread over two days. It’s good, because it looks like we have planning time built into the schedule. I will also have an English Camp class to lead, which is conversation where students can just drop in. It seems I’ll be teaching until 6:30 three nights at week on M, Th and F. As a morning person, that isn’t ideal. For dinner, since I had a big lunch and am tired from our day and from lugging stuff home, I eat half of a shrimp and pasta dish I got, again from my trusty 7-11, accompanied by a slice of bread and an Asahi beer.